Boyce was studying to be an architect until he met David Cox at Bettws-y-Coed in August 1849, which inspired him to be a landscape artist. In the early 1850s, he met Rossetti and was accepted into the Pre-Raphaelite circle. His diaries which he kept between 1851 and 1875 provide a fascinating insight into their activities. He exhibited a number of Ludlow views in the early 1870s (see Christopher Newall and Judy Egerton, George Price Boyce, 1987, p. 60, nos. 53 and 54). 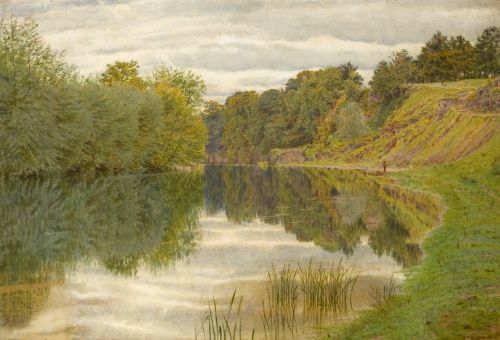 This is likely to be one of the two views on the river Neme which he exhibited at the Society of Painters in Water-colours in 1873 and most probably ‘The Teme at Ludlow, September.’ A smaller sketch of this view, inscribed and dated October 1872, was sold at Christie's South Kensington on 22nd February 2011, lot 276. 10.1 by 20.9 cm., 4 by 8 ¼ in. This watercolour dates to a trip made by Boyce to the north east of England in the late summer and autumn of 1864. The scene depicted is a distant view of Newcastle, seen from across the river Tyne at Gateshead, with the prominent tower of the cathedral of St. Nicholas barely visible at the left of centre. The steeply sloping Rabbit Banks from which Boyce made this watercolour (as well as the larger version of the same composition), has long since been built over, and may today be identified with Pipewellgate in the area of Bensham in Gateshead. Boyce exhibited two Newcastle subjects - Newcastle from the Windmill Hills, Gateshead and Newcastle from the Rabbit Banks, Gateshead - at the Old Water-Colour Society in 1865. Although it has been suggested that it was the larger, daylight version of Newcastle from the Rabbit Banks that was shown at the OWCS, a description of the exhibited work in a review in the Athenaeum would however seem to favour the present, more dramatic, nighttime scene as the work exhibited. As the anonymous reviewer noted, ‘Among the recently elected members of this Society, by far the most original artist in landscape is Mr. Boyce, who treats with such perfect solemnity, beauty, richness and truth of colouring, some of the most commonplace themes...a distant view of a manufacturing town interests us in its million lives and fortunes; its subtle colouring seems pathetic, and a glowing sky looks full of prophecy...Given these successes with unchallengeable fidelity, and we have a great artist. Such is Mr. Boyce’ (see `Society of Painters in Water-colours’, The Athenaeum, 20th April 1865, p.594).